6th Graders study prehistory in Social Studies. 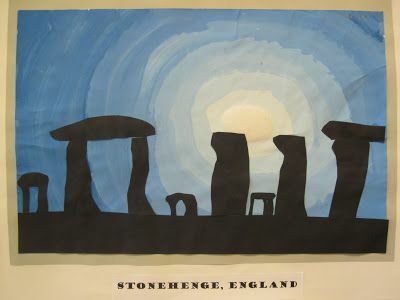 Last week I showed them images of Stonehenge and discussed the idea of prehistoric sculptures & structures. Then we created these silhouettes, putting a new spin on value scale paintings. I love this lesson on paint mixing and value, and it looks really lovely done in purple too. Some of the kids chose to tear their black paper to make the stone shapes. Love your stone henge works! Looking forward to seeing your cave paintings! Cute! Can you please explain the process a bit? I'd like to have my 6th graders do something similar. This is about a 3 day (40 minute) assignment. First day I demo mixing color value from white to blue, explaining that they need to go slowly and that you can't go backwards. This is done in 18x12 paper. We also look at images or Stonehenge (they are learning about prehistory in social studies) and discuss the theories/ideas behind it. Lastly we look at images of silhouettes and discussed the idea of light blocking, etc. Second day the kids view the image of Stonehenge again, and draw the contour of the rocks. They are given a piece of black construction paper and instructed to draw what they see, making sure to include the ground. Cutting and gluing take the rest of this class, and the next.